SLEEP INTERRUPTED is one of the most informative books we have ever read on Sleep Apnoea and UARS (Upper Airways Resistance Syndrome). Dr Steven Park, MD, is an Author and Ear Nose + Throat (ENT) Surgeon with a thriving practice in New York and is Board Certified in Sleep Medicine. 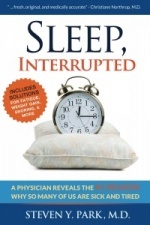 He works tirelessly in promoting awareness of Sleep Apnoea (spelt Apnea in the USA), and he has helped thousands of men and women breathe better, sleep better, and live more fulfilling lives. His passion is to identify and empower people to overcome sleep-related breathing problems. 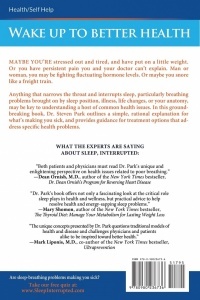 Dr Steven Park reveals in the book "the No 1 reason why so many of us are sick and tired!" Common Ear, Nose and Throat Conditions:- What You May Not know! Stressed Out, Tired and Sleepy? How Do I Know If I Have a Sleep Breathing Problem? For people who prefer it, the book can also be bought as digital version for Amazon Kindle and by clicking on the Amazon link below you will be supporting the Hope2Sleep Charity, and every little contribution helps! 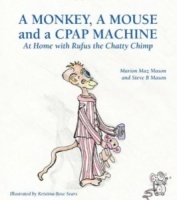 I found this book useful for understanding my sleep apnoea better as well as my husband's pulsatile tinnitus.